FORT BRAGG, North Carolina – The Clayton Bootleggers opened up their Carolinas D3 season in style with a 87-24 victory over Fort Bragg. 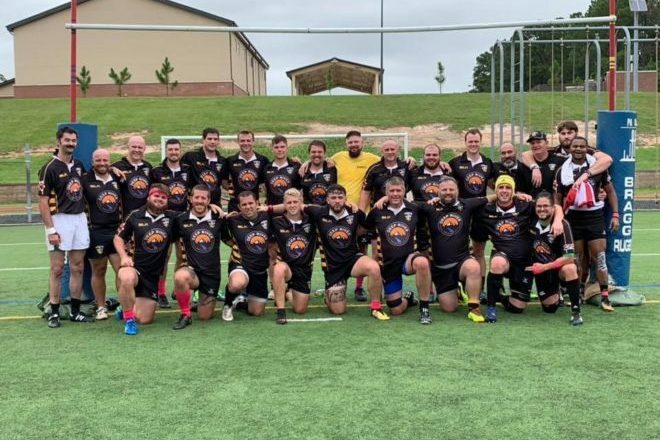 It was a dominating effort from start to finish for the Bootleggers’ 1st team against a Bragg side that was stronger than the scoreboard reflected. Clayton ran in a total of 15 tries with seven different players crossing the whitewash during the match. The emphatic win was exactly what the club was looking for to start the new season. The Bootleggers used a patient and structured attack to create and exploit mismatches throughout the match. It didn’t take long for the Bootleggers to get onto the scoreboard as Jared Garcia started off the scoring in the 4th minute and then followed it with another try a few minutes later to stake the visitors to a 10-0 lead. Continued pressure from Clayton led to a penalty just inside of the Bragg half. A nice kick to touch from Gareth Davies led to an attacking lineout for the Bootleggers just outside of the Bragg 5 meter line. Clayton went straight to their maul and slowly drove the ball towards the goal line. With the maul appearing to stall out, Ed Dixon broke away from the back of the maul, found a crease to the defense, and went over for a try. Dixon converted his try to give the Bootleggers a 17-0 lead with 14 minutes played. In the 20th minute, Davies crashed over the line for his first of three tries in the match. Another conversion from Dixon extended the Clayton lead to 24-0. Bragg then buckled down on defense and the sides began trading possession. Bragg began to create some go forward with their pack and worked their way into the Clayton half. Bragg flyhalf Lauivaa Tavai got the home side on the scoreboard with a nice run. Justin Parker converted the try as the Bootleggers’ lead was cut to 24-7 with less than ten minutes to play in the half. The rest of the half was all Clayton as Austin Lyons, Davies, and Garcia each scored tries to put an exclamation point on the half for the Bootleggers. Dixon converted 2 of the 3 tries as Clayton took a 43-7 lead into the half. The Bootleggers continued to keep up the pressure on Fort Bragg as the second half began. Trey Eason was the first Bootlegger to score in the second half as he added a 49th minute try that was converted by Dixon. A few minutes later Lyons added his second of the day which was converted by Dixon to extend Clayton’s lead to 57-7. One of the best tries of the day came in the 55th minute as wing Wes Smith gave chase to a kick from midfield, put another foot to it, and then won the race to touch it down in the end zone. The impressive score pushed the Bootleggers lead to 62-7. With the score beginning to get out of hand, Fort Bragg struck back with two tries in quick succession. Timoci Volavola scored a long range try that was converted by Collin Hayward in the 60th minute. Off of the ensuing kickoff, Bragg broke free after a few phases and Quentin Patten added another score to cut the Clayton lead to 62-19. The Bootleggers bounced back with another try from Eason and two more from Lyons to bring his total to four in the match. The barrage pushed out the Bootleggers’ lead to 77-19. Bragg added one final score as Patten went over for his second try of the match with less than five minutes to play in the match. The visitors bounced right back with tries from Paul Castellana and a final score from Davies, his third of the match, to close out the score at 87-24 in favor of Clayton. The match was a complete effort from the Bootleggers as the squad received contributions from all 23 players on the roster. 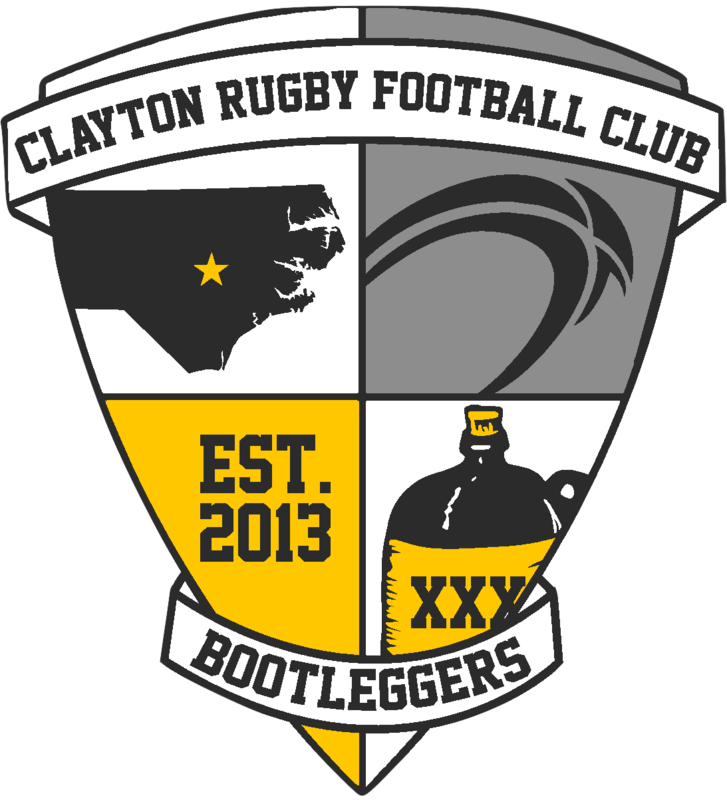 The Bootleggers’ 2nd side opens up their D4 season this coming weekend as they travel to take on Southern Pines D4. The Bootleggers return to D3 action at home on October 20th when they host the defending Carolinas D3 Champs Asheville in a big divisional match.